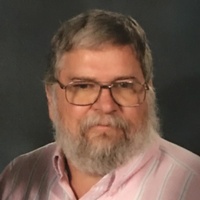 Richard Ray Ebert of Blackwell, Oklahoma, passed away early Wednesday morning, November 7, 2018, at his home at the age of 61 years. Richard Ray Ebert was born on August 23, 1957, in Blackwell to Joseph Merle and Geraldine Mae (Wilkerson) Ebert. He grew up in Blackwell and attended Blackwell Public Schools and Pioneer Area Vo-Tech. He graduated from Blackwell High School in 1976. Following his education he began working in the core room at Electron Corporation worked there until the plant closed in 2001. He then returned to school and attended Autry Vo-Tech in Enid where he studied and became licensed in small engine repair. After certification he owned and operated his own small engine repair service. He later worked for the Blackwell Public Schools and Wal-Mart. He was a member of the First Christian Church in Blackwell. He enjoyed photography, fishing and studying family genealogy. He is survived by his wife, Tina Ebert of Blackwell; two daughters, Felicia Smith of Eagle Butte, South Dakota, and Jessica McClaflin and husband Kenneth of Blackwell; a sister, Kathi Dunham and husband Daryl of Longview, Texas; and two brothers, Joe Ebert and wife Cathey of Medford, and Jon Ebert and wife Connie of Gilroy, California. He was preceded in death by his parents; and a step-mom, Wanda Ebert. A memorial service is scheduled for 10:00 a.m., Monday, November 12th in the First Christian Church in Blackwell with Rev. Jeff Koch officiating. Burial will be in the Blackwell Cemetery at a later date. A memorial has been established in his honor with the First Christian Church in c/o Roberts and Son Funeral Home, 120 W. Padon, Blackwell, Oklahoma 74631.